Throughout film history, Bollywood has been recognized for incorporating song and dance even during serious subject matter. In Satyajit Ray’s Pather Panchali, the first of Ray’s three part Apu Trilogy, neither are included. Satyaijit Ray impacted not only Indian cinema but is considered one of the greatest auteurist to have ever lived. One of the greatest factors that make Satyaijit’s films so highly regarded is his use of long takes and realistic scenes. Ray is known to have been influenced by the italian neo-realist movement which comes through in his films. It is clear that The Apu Trilogy is an homage to this movement. This statement can specifically be proven through Pather Panchali. 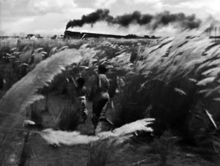 One of the most highly regarded scenes in Pather Panchali is the scene where Durga and Apu, siblings, escape their impoverished life to frolic about the Kaash grass, simply exploring their natural surroundings. This scene directly shows a italian neo-realist influence. To understand how this scene references italian neo-realism the movement must first be understood. After WW2, Italy was left in economic and moral turmoil. Many directors and writers including Vittorio De Sica, Federico Fellini and Luchino Visconti reflected on these post-war effects on society by producing realistic film. These directors tried to make their films as life-like and relatable as possible. With realism comes realistic timing. In a majority of film, simple tasks are often shorter than they would be in reality because there may be a time limit to the film or to the director it may be viewed as trivial. Italian neo-realist film tries to accurately depict the time it takes to preform everyday tasks. A significant example would be the famous scene from Sica’s Umberto D. where a maid is grinding coffee. A majority of film would not realistically portray the time it takes to do such a task. Italian neo-realists believed in the beauty of everyday life even it was sullen and frankly humdrum. They made viewers appreciate simplicity; they made it into an art form. Ray felt moved by this concept and chose to incorporate realistic time in his films through long shots. Many scenes in the film focus for long periods of time on simple every day situations for an impoverished family in Bengal for this reason. Arguably the most beautiful long shot in the film is the train scene. It begins with Durga looking up at power lines which alone takes seventeen seconds. Already, even with no dialogue, the scene speaks volumes. Durga, to the viewers knowledge, has no concept of power lines. The characters never appear to be on the phone and live in a house/hut hybrid. This clearly portrays the separation of indians in poverty and those who are well-off. There is no dialogue. Italian neo-realist film also often had long takes with little dialogue. Apu walks towards the power line pole and presses his face to it. Durga and Apu continue to walk through the large Kaash grass. The Kaash sways in front of the camera making the setting ideally and aesthetically pleasing to the viewer. The siblings continue to explore the grassy terrace. Apu finds what I believe to be a sugar cane and finds is sister sitting elegantly under the tall grass. The scene feels so natural as if there is no acting involved and though the shot is long and lacks discourse it remains engaging. Ray leaves the natural sound of the strong wind in the scene as well. Just like it is believed that these siblings have never observed power lines or are even aware of their purpose, when we see the train we assume this is also new. Ray chose to use off screen space and not show the train right away so that the viewers eyes are exposed to the train only when the children are. It is no exaggeration to say that one may even feel their curiosity and amazement towards their first look at the vehicle. Ray’s close shot of the train moving helps to convey how strongly they are observing this moving object. After the train has passed, the camera does not move, focusing on the smoke left behind. Just as Sica shows the appreciation of everyday tasks, we come to appreciate objects and modes of transportation we take advantage of every day. I can’t personally remember the first time I had seen a train with new eyes but this is the closest I will get to this experience. Satyajit Ray’s Panther Panchali shows that it has been clearly influenced by the italian neo-realist movement. Ray successfully put his spin on realistic film while using long shots to portray every day life for a poor Bengali family. The train scene is deemed one of the greatest spectacles in film history while still acting as an homage to the neo-realist movement. Satyajit Ray deserves his rank as one of the greatest auteurists[sic] of all time. Though I did not attend the experimental art film class I have chosen to do a review on Mothlight. I’m actually familiar with Mothlight because my friend goes to a prestigious film school, was shown it in class and then showed it to me knowing of my interest in film. Stan Brakhage changed the way many artists thought about cinema through his use of real natural objects pressed straight onto and between strips of film. Outside the box thinking has always attracted me and therefore I enjoy Mothlight. After watching the short film multiple times I have come to find the moth wing a little disturbing. I start to think about how Moths tend to burn up and die in the light that they are attracted to so I continue to imagine the wings disintegrating. I’m not sure if this is what Brakhage was trying to convey or felt himself but it is how I personally emotionally feel. I also get a sense that his use of flowers, dirt and weeds exist to show the environment the moth may have lived in. I know that Brakhage did not just randomly choose to use natural elements but that they were translucent enough to be projected. He manages to bring together a cohesive idea as simple as it may be. Even so, the viewer is completely immersed in the idea that this is a film. This is not an escape, but a film. We see the light being projected onto the natural found objects and we see the strips rapidly moving. This may be the closest thing to realistic film as we can get. I remember walking out of the classroom after seeing Pather Panchali relieved. I am generally very patient with film. I mean, one of the top films on my list at the moment is Bela Tarr’s Sátántangó which runs about 450 min. I also really enjoyed Ozu which also had a slow pace. After deciding to write my analysis on Pather Panchali I re-watched certain scenes finding the beauty that lies within the film. Each segment is carefully shot and is truly alluring. I am definitely going to sit through the entire film at least one more time. In some ways I feel that a film should not be of acquired taste but it isn’t unlike me to re-screen a film that didn’t previously spark my interest or disappointed me. I couldn’t even tell you how many times I’ve tried to watch Blade Runner and enjoy it. I am confident that I will end up truly appreciating Ray. One thing I know will continuously bother me is the elder. It may sound crude but her physical appearance turns me off to such a degree that I could never identify with/like her character’s company. Though I find her role important she will forever bother me. I honestly wanted her to die. I knew it was coming, I just wanted it to come sooner. I know the trilogy is considered one of the greatest of all film history and that really means something despite reviews that stated it was too long. Ray put his spin on the long shots used in italian neo-realism. Every second of film was included for a reason. He really wanted to audience to appreciate every single moment of the character’s lives. I think all of us should re-screen Pather Panchali on our own time with more appreciation and understanding. I’m hyped up on coffee and green tea and ready to write these wonderful film reviews I have let linger for so long. I am not just starting with Penn’s “Bonnie and Clyde” because it was the most recent film our class has screened but because I am always blown away by one particular scene that everyone seemed to leave out in their analyses. What scene you ask? The first scene of the entire film, and not even the entire scene. It might be because I’m strung out on caffeine that I’m writing the way I am but the first scene of the film always speaks volumes to me about Dunaway’s character. We’re only two minutes and forty seconds into the film when Bonnie walks from her mirror to her bed, collapsing gracefully. Mind you, there’s no dialogue whatsoever. Faye Dunaway, (Bonnie) looks out between the bars of her bed frame and begins to angrily paws and punch the bottom bar. After repeatedly doing so she pulls her her body up to the bars, pressing her face between the frame. The camera then zooms up to her eyes; remaining there for at least five seconds. I find this to be one of, if not the most powerful scene in the entire film. This may be an audacious statement but it is the only scene in the film that gives me literal chills. Penn successfully revealed so much about the character without saying a word. So, what exactly has come from these few moments? Dunaway, pressing her face between the bed frame seems like a decently obvious metaphor for feeling caged, having a feeling of ennui about life, etc. All the same, it’s shot so beautifully and at such a perfect angle that though somewhat cliche it still strikes me as amazing. From these few second alone we already understand she leads an uneventful dissatisfying life but Penn pushes this feeling further by shooting a close up of her eyes. Dunaway effortlessly convinces the viewer that she truly unhappy and feeling restless with her current situation. Though it may be impulsive that she runs off with Clyde, it should make sense to the viewer why. Hopefully you’ll re-watch this scene and appreciate it as much as I do. Someone let me know what experimental films we’ll be watching today? This definition is no stranger to the fine art world but for this essay, tenebrism is a defining factor for another form of media all together; film. It is not well known that Orson Welles first and foremost wanted to be a painter* though it is known that Welles contributed to the theatre and film throughout his life. How could tenebrism possibly relate to film? If one has ever viewed “Citizen Kane” (Welles, RKO, 1941) ,arguably Welle’s greatest contribution to cinema, it is plain to see why. “Citizen Kane” is even known as “American Baroque”. Many scenes within the film are reminiscent of baroque style painting. One that stands out and may remind an art enthusiast of Caravaggio especially, is the scene after Kane takes over the Inquirer. The use of Tenebrism is apparent as well as other aspects of Caravaggio’s paintings. Baroque style painting is special in that it was meant to create visceral response in it’s viewers often to help bring individuals back to the catholic church after the Protestant reformation. Baroque painting was often dramatic, theatrical and lit with very distinct light and dark contrast. Caravaggio, one of the most famous Baroque painters of the 16th century was known for this heavy light and dark contrast, better known as chiaroscuro. Citizen Kane also uses chiaroscuro. There is a sharp contrast between light and dark to the degree that it’s impossible to ignore within the film. After Kane takes over the Inquirer, a newspaper company, he instantly begins to have his team pump out gossip and news that will gain readers and loyal followers of his paper. In this scene, Charles Kane is seated at his desk as his partner Leeland enters with a cartoon for an upcoming article. Carter, the previous owner of the Newspaper company, stands vulnerable and livid as the entire company is revised before his eyes as he is allowed no say. Kane goes on to explain a story about a woman missing and how he can create drama in the news if his paper states that the woman “Mrs.Harry Silverstone” has been murdered even though it hasn’t been proven. This is all interesting but the dialogue is not the focus of the paper. An art enthusiast with an understanding of Baroque painting may instantly pick up on the lighting in this particular scene. 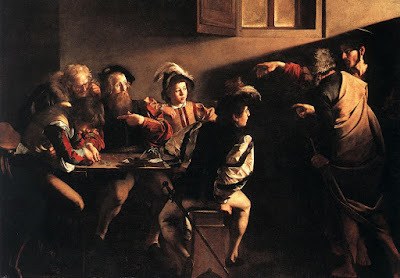 It may also specifically remind them of Caravaggio’s “Calling of Saint Matthew”, filled with distinct light source. At the beginning of the scene there are two small light sources; a lamp behind Kane and a lamp behind Carter. These light sources, like a Caravaggio painting, do not light the entire room and create a sharp contrast between where the light directly hits and where it ends. The camera pans over so that Mr.Bernstein, an assistant of Kane’s comes into the foreground and the sources disappear though the light is still visible and obviously coming from specific areas of the room. The room is filled with shadows and dark contrasts. Carter goes on a rant about how the news shouldn’t be filled with unproven gossip but is interrupted by Kane exclaiming “Mr.Carter!”. The camera angle completely changes , now with a desk lamp and Charles Kane at the foreground. This is also reminiscent of Baroque style. There is one distinct light source and looming shadow over Carter’s head. The contrast between the shadow and the light are so distinct that it makes one believe that Welle’s must have been aware of tenebrism. The dramatic feel of the light aids in dramatic effect in this scene and throughout “Citizen Kane”. The influence of Baroque style painting on “Citizen Kane” is impossible to ignore. Many scenes seem to conjure Caravaggio’s style and use of chiaroscuro. This contrast is so apparent that Citizen Kane was and still is considered “American baroque cinema”. This is quite an honor. I forgot to put a clip up last week. Sorry for the terrible quality. This is one of my favorite scenes of all time from Vincent Gallo’s Buffalo ’66 I should really start doing actual reviews but I’m currently a bit overwhelmed. By Sunday I should hopefully have at least one review up and one or two extra credits as well. I’m sure the people who know I went to see 2001: A Space Oddyssey yesterday are anxious to hear my thoughts on it. Okay, well maybe not anxious, haha. I also met Keir Dullea. Hopefully this means something to at least one of you. This is actually one of my favorite Woody Allen films. It takes a little prior knowledge about film to understand the humor but I’ve shown this film to people who have only seen ‘La Dolce Vita’ and ‘8 1/2’ and still found it funny. I’m going to post some of my favorite scenes from films… possibly weekly or maybe sporadically. We’ll see how it goes. Truthfully, it’s just that this song is stuck in my head and I’m really excited we’re eventually watching “À bout de souffle ” or “Breathless.” So this is as much for me as it is for those who view my blog. Hello media studies class! My name is Regina Harsanyi, though I prefer to be called Regie and I am a lover of film. I’m an art history major and most likely will minor in film studies. Why? Film is a part of me. Film is a medium that truly makes me happy, elated even. There are a few movies on the syllabus that I haven’t seen so I’m excited to gain new perspective, and even hopefully new favorites. I knew from the moment I saw that we were watching ‘M’ that this class will not be seen to me as work but something I’ll enjoy. I mean, I’m so nerdy about Fritz Lang, a few months ago I went to see ‘Metropolis’ in an art theatre with all the newly restored footage and a live score x_x. It was marvelous! A class where extra credit is to see a french new wave or classic japanese film in theatres and review it afterwards? Anything but a chore in my eyes. I hope everyone is as passionate as I. Maybe I’ll find someone who shares my interests finally because so far as a freshman living on campus, I’m yet to.